With dark chocolate pecans you have the opportunity to experience the astounding flavor that results when you combine intensely rich dark chocolate with the mellow, nutty taste of pecans. These nuts provide a phenomenal experience for your tastebuds. They are stunning in a serving bowl on a party table, but you'll have to admire them quickly before they disappear. Dark Chocolate (Sugar, Chocolate Liquor, Cocoa Butter, Anhydrous Milk Fat, Soy Lecithin (An Emulsifier) and Vanilla), Pecans, Gum Arabic, Corn Syrup, Sugar and Certified Confectioners Glaze. One bag contains about 110-120 pieces. Excellent quality. 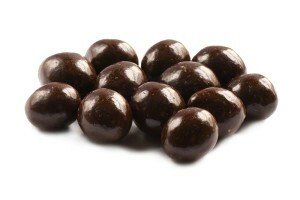 These are hard to find except at grocers that sell bulk items, and their chocolate is very inferior. Just as good as my previous order. I took six bags with me as Xmas gifts to Belfast and Budapest! Wonderfully received! — I’ll be back! What a first time experience with Nutstop! Couldn’t be better. Great product! Thanks so much. The best pecans i have ever ate and i will order them again as soon as it gets cooler. These are delicious. They came quickly and were packaged well. I got these and the milk chocolate covered pecans and loved them both. I think the dark chocolate gives them more of a kick. Definitely worth the price! Earn up to 167 points.